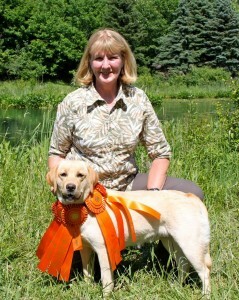 GoldenMoon Labradors is proud to announce that our youngest member “Beatrice” (at 13 months old) earned her Junior Hunt Title on June 9, 2012.
for her winning Title ~ JH. Parents – Buttonwoods McIntosh, CGC “Mac” x GoldenMoon’s Thyme for Thanks, CGC,WC,JH,TDI We’re so thankful for this huge accomplishment. I should have known that this ability was bred in with her mom “Genny” being nicknamed by her JH judges “Rocket Girl” for excellent ability marking,running,retrieving ducks with great speed and accuracy. I’ve just never attempted this level of training with a dog this young and Beatrice certainly showed me that she was more than able ~ now on to Senior Hunt! We had a great time with lots of fun.